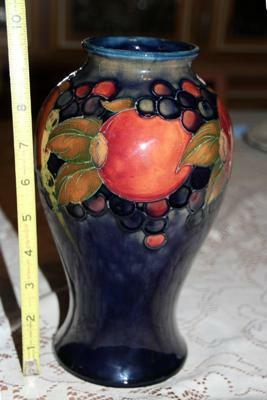 In packing up my mother’s home after her recent death, I came across a Moorcroft Pomegranate vase. I have been researching online but have been unable to find one like this, so I am curious as to it’s approximate value. It is 9.5″ tall, 4.25″ across the base, and 5.5″ at it’s widest part. It has 5 pomegranates around it, plus what appear to be grapes. 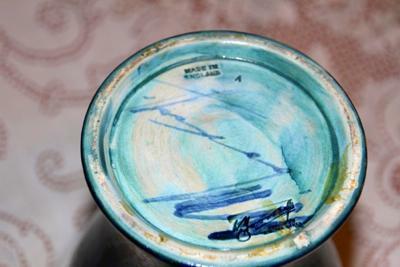 From what I have read, I believe it is signed by William Moocroft and is stamped under the signature what appears to be “Potters to the Queen”. I have found several similar vases online, but none are this height and none have 5 pomegranates (usually 4). I would appreciate any help you could give me on it’s date of manufacture and approximate value. That looks like a lovely Moorcroft vase Laurel. It probably dates somehwere between 1928 and 1949 and the Pomegranate pattern is highly collectable as are this size and shape. As the antiques market is fluctuating a good way to guage current interest and values is to compare interest in other Moorcroft pomegranate items. The best place for that is in the Moorcroft Pomegranate section. A quick look showed a good mix of pomegranate items for sale including a similar 7.5 inch vase which would be worth watching.